The highly acclaimed regional choir Hunter Singers was founded in 1989 by Kim Sutherland OAM and is celebrating its 30th Anniversary this year. There are currently 35 singers in Hunter Singers, representing 10 government high schools in the Newcastle and Hunter area. There have been many highlights for the group, including outstanding commissions and 11 international tours. In 2018, Hunter Singers toured to Canada for the Kathaumixw Festival in Powell River British Columbia. They have also toured throughout Australia and to the UK, France, USA, Italy, China and New Zealand. Hunter Singers has commissioned works from some of Australia’s leading composers, including Michael Atherton, Stephen Leek, Sally Whitwell, Paul Jarman and Matthew Orlovich. In 2016 Hunter Singers performed Fromelles by Paul Jarman at the Centenary Commemorations for the Battle of Fromelles in Fromelles, France. It was an honour for the group to be able to present the piece they commissioned with the assistance of the Federal Government’s Anzac Centenary Arts and Culture Fund. 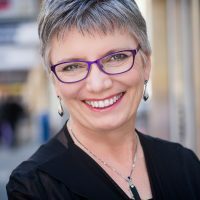 Kim Sutherland OAM is the Founding Music Director of Hunter Singers and the Head Teacher of Creative and Performing Arts at Merewether High School, an academically selective school for gifted and talented students in Newcastle. After graduating from Sydney Conservatorium, Kim studied conducting with Myer Fredman and Mats Nilsson and completed her Master of Creative Arts degree at the University of Newcastle. She has conducted the Festival Chorus at the Newcastle Music Festival in 2017 and 2018, and Gondwana Novus at National Choral School in 2017, 2018 and 2019. Kim’s service to the arts was recognized with the award of an Order of Australia Medal in 2013.